Today, steel is used very extensively in almost every industry and its products reach every household in one form or another. Steel is manufactured in various compositions and these alloys have different properties. The property of the steel is derived from the characteristics of the element alloyed with the steel. The cost of the steel depends upon its composition and use. Boron steel has high hardenability (the capability of a metal alloy to be hardened by heat treatment) and strength. Boron, when added to fully oxidized steel, especially low carbon steel, gives the steel these properties without the loss of ductility (ability of a material to be elongated in tension), formability (capability of a material to be shaped) and machinability (the ease with which a metal can be machined to an acceptable surface finish). Boron is usually added in range of 0.003-0.005 percent in this steel. Carbon acts in dual fashion when alloyed with steel. Adding carbon to steel controls obtainable hardness and adds substantially to hardenability of the steel. Carbon steel has improved hardenability. These steels are used in less critical applications in noncorrosive environments and are not usually heat treated. The percentage of carbon in carbon steel is usually kept in the range of 0.06-0.90 percent. Chromium steel has high hardenability and high resistance to corrosion and oxidation. This steel can withstand high temperature and has high abrasion resistance. Chromium steel can be brittle and contains chromium in the range of 0.15 percent and above. Chromium and molybdenum both individually add to the hardenability of alloy steel. This steel is highly resistant to corrosion and oxidation. It can withstand high temperature and is abrasion resistant. Molybdenum in the steel maintains hardenability in the required range and increases high temperature working strength. The amount of chromium in this steel is kept between 0.40 and 1.10 percent and molybdenum is in between 0.08 and 0.25 percent. Nickel-chromium steel has high hardenability. This steel is resistant to corrosion because of chromium and has high abrasion resistance to oxidation and abrasion. It has high temperature strength and offers much greater toughness at a specified carbon level. The amount of nickel in nickel-chromium steel is in between 3.25 and 3.75 percent and that of chromium is 1.25 to 1.75 percent. Chromium-vanadium steel has high toughness. It is resistant to corrosion and oxidation, has high temperature strength and abrasive resistance. Both chromium and vanadium increase the hardenability and vanadium inhibits grain growth during heat treating. The alloying range of chromium in chromium-vanadium steel is 0.80 to 1.10 percent and the amount of vanadium is 0.15 percent and above. High strength steel is specifically manufactured steel that has high strength and can be worked upon at very high temperatures. This steel is suited for specific applications where strength is the primary requirement. The general composition of high temperature strength is usually; carbon (0.27 to 0.38 percent), manganese (0.60 to 0.90 percent), silicon (0.40 to 0.60 percent), chromium (1.0 to 0.90 percent), nickel (1.85 to 2.0 percent), molybdenum (0.35 to 0.40 percent) and vanadium (0.05 to 0.23 percent). 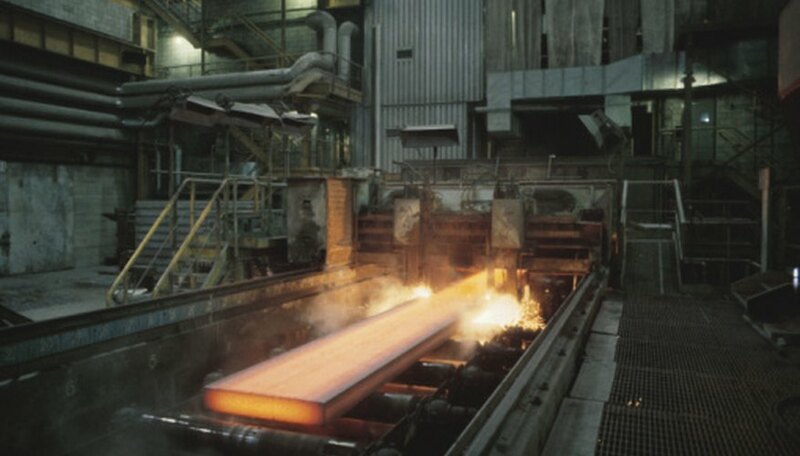 High temperature steel is designed for applications in boiler tubes, pressure vessels and steam turbines where high temperature operation is required. These steels are highly resistant to mechanical and chemical degradation at elevated temperatures. The usual composition of high temperature steel includes carbon (0.28 to 0.50 percent), manganese (0.45 to .90 percent), silicon (0.15 to 0.75 percent), chromium (0.80 to 1.50 percent), nickel (0.25 to 0.50 percent), molybdenum (0.40 to 0.65 percent) and vanadium (0.20 to 0.95 percent). Rakesh, Vaibhav. "Properties of Steel Types." Sciencing, https://sciencing.com/properties-steel-types-8059219.html. 24 April 2017.